This week we took advantage of the early spring we are having on the summit this year and did one of our favorite hikes, up to Rowton Peak (see the trail description here). 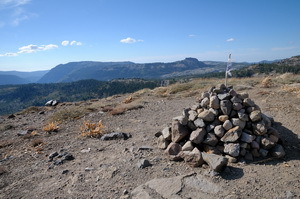 As with most hikes here on the summit, this hike involves a pretty good climb that results in spectacular views of the summit area. The hike is a nice loop that can be done in either direction (doing it in a clockwise direction is probably a little easier). 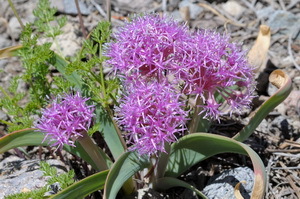 The wildflowers are just starting to bloom along the trail, with the Pink Star Onions having a banner year along the rocky ridge lines. They are just blooming this week and should be in full bloom for the next week or two. Make sure you rub a leaf on one of these beauties and smell the subtle onion odor they produce. In the next few weeks the Lupine and Mariposa Lilies should start appearing. This is a colorful hike all summer long. As great as the flowers and the forest are, it is really the geology that makes this hike so special. Rowton peak sits at the west end of Razorback Ridge, whose sheer south face is made up of truly impressive volcanic pinnacles and hoodoos. It is a continuation of the pinnacles ridge that starts at Mt Lincoln. Looking over these formations you can see all along the Sierra Crest ridge from Crows nest to Granite Chief. When you get to the peak itself don’t forget to sign the register and spend some time reading some of the previous comments from other visitors. 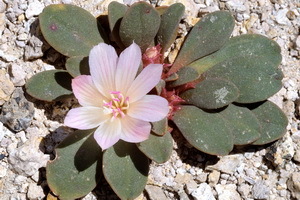 There is a hidden treasure on this hike that shouldn’t be missed. About halfway down the west ridge trail on the steep ridge face is a rare rock formation, a natural bridge. Erosion has carved an arch into a volcanic hoodoo to form this see through formation. Finding this formation can be tricky, especially if you are climbing up the west ridge trail. From the trail you can only see the top hoodoo of the formation and it is necessary to go right to the brink of the ridge to see the entire bridge. 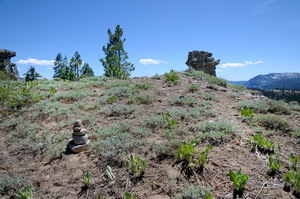 I have placed a cairn along the trail to mark the formation to make it a little easier to find it, so keep your eyes open. WARNING: The rock making up the ridges in this area is a combination of volcanic and composite and is very weak. The ridge is also very steep. This combination makes for dangerous scrambling on the rock formations. It is possible to climb out on the natural bridge, but if you do this be very careful because the rocks are very crumbly and hand and foot holds are unstable. On our Rowton hike we found several sets of motocycle tracks on the entire hike, up to Rowton Peak and along Razorback Ridge. Now that Royal Gorge is in receivership, there doesn’t seem to be any stewardship of the land and it is prone to abuse by the off roaders (I am an off roader myself, but the hiking trails are off limits). I know I’m preaching to the choir for most of the readers of this blog, but it seems like there is a real danger that our local area is in danger of being overrun by off roaders if something isn’t done soon to resolve the stewardship issue.